Bookings are now LIVE for our Easter Holiday club! There's just not quite enough of us in our little team to go around so we are seeking a new recruit! Sheffield Woodland Kindergarten, Sheffield’s ONLY fully outdoors nursery offering all year round care for children aged 2-8 years has an exciting opportunity to take on a new team member. The right candidate will have two set shifts per week on a Mondays and Tuesdays, working 10-20 hours per week. There will be opportunity to increase hours of work and take on extra hours covering holidays/training/sickness etc. Are you passionate about a different approach to early years learning? Do you hold a childcare level 3 qualification? Are you able to sing nursery rhymes on repeat? Do you see a puddle as a learning opportunity? Would you like to cook on a campfire? Can you recite ‘We’re going on a bear hunt’ as you stomp across a meadow? Do you have a magical imagination? Would you like to be part of an innovative team? Then this could be the opportunity you’ve been waiting for! Please send a c.v. and cover letter to sheffieldwoodlandkindergarten@hotmail.com by Tuesday 4th December. We will be shortlisting candidates and inviting in for interviews on Monday 10th December and Thursday 13th December. We are taking a break from playgroup in September to allow our new kindy kids chance to settle in before they head off site for adventures. We will return for some autumnal fun on 1st October. Please spread the word to friends to avoid anyone being disappointed! We are now taking bookings for May Half Term/Spring Bank Holiday! Check out our swish new bookings website for more details and to secure your child's place. We are taking bookings for the Easter Holiday Club, days are already becoming booked up so email us now to avoid disappointment. Check out our 'Holiday Club' page for more information. If you've had trouble contacting us by phone over the last week, we're having a few technical difficulties! Please bare with us, drop us an email or Facebook message instead! Sheffield Woodland Kindergarten, Sheffield’s ONLY fully outdoors nursery offering all year round care for children aged 2-8 years has an exciting opportunity to take on a new team member. The right candidate will have one set shift per week on a Tuesday working 9-4.30 and be available to start work with us on 27th February. There will be opportunity to increase hours of work and extra take on hours covering holidays/training/sickness etc. Please send a c.v. and cover letter to sheffieldwoodlandkindergarten@hotmail.com by Sunday 4th February 2018. We will be shortlisting candidates and inviting in for interviews on Wednesday 7th and Thursday 8th February. We are now taking bookings for our Easter Holiday club 10th-13th April. So if you've got an adventure seeker this is the place for them! Please email us to secure your child's space and for more information. For details on times/price/age check out our Holiday Club page on the website. We are now taking bookings for our holiday club in half term! The children will have opportunity to learn about and make they're own fire, experiment with pancake recipes and flavours and lots of time for free play, mud kitchen, tree climbing and friendship making! Please email us at sheffieldwoodlandkindergarten@hotmail.com to book your child's adventure! Come and join us on Monday 19th December 10-11.30 am for the last playgroup of the year! A festive trail in the woods, Christmas crafts and a special selection of winter warming food cooked over the fire. We are now closed for 2 weeks until Monday 8th August when we will reopen for Holiday club and playgroup. Check out this lovely write up about us in the Sheffield Telegraph! An open day for families interested in the kindergarten, holiday club or playgroup. There will be staff on hand to meet, greet and tell you all about what we do as well as activities to become involved in. You will have chance to ask as many questions as you like, explore the site and try some snack cooked on the fire. We will be celebrating hedgehog awareness week by creating clay hedgehogs. Summer camp is coming up and tickets are now on sale. It's taking place between 17 - 19 July at Cotton Star Camping and activities will include kids yoga, adults pilates, campfire cooking, felting, storytelling, group walks, balance bike workshops, music and much more. No tent? - you can hire one! 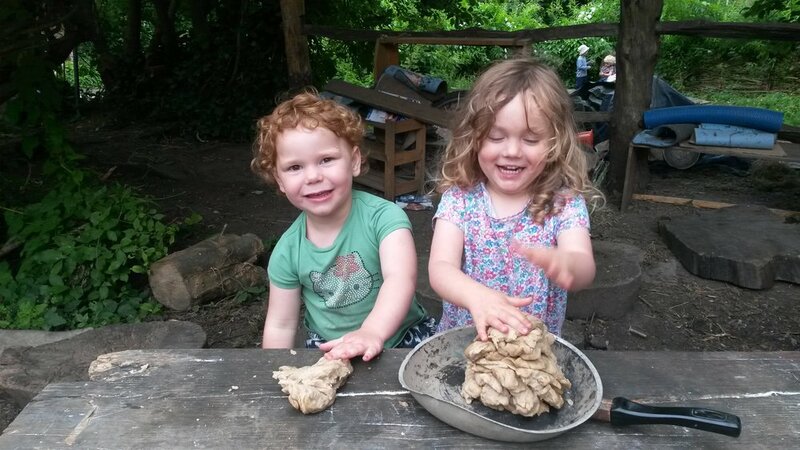 On 29 June we celebrated International Mud Day by creating a mud pit, squelching the cool mud between our toes, painting our bodies with clay, making clay models, mud ball throwing and eating chocolate brownies! Our manager Helen is going to be doing a Skogsmulle leader course in July. A Skogsmulle is a Swedish nature teacher. She is super-excited about it and we are too! Helen will be one of the first 20 to be trained in the UK.